Canon has announced that it will be showing off a 3D rig at IBC, with the company pairing two of its brand new X105 camcorders to get the extra dimension. Canon's XF105 camcorders were only announced at the end of August, but the company has clearly been readying a 3D rig using its latest high-end cameras. The XF105 is apparently the smallest to offer the broadcast quality MPEG-2 Full HD recording codec - and brings Full HD recording at 50Mbps and 4:2:2. 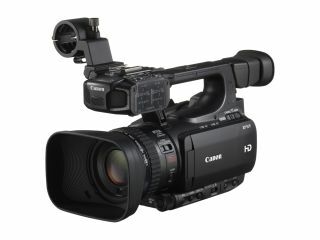 "For the first time, Canon will be displaying a 3D shooting rig using two newly announced XF105 camcorders," announced the company in its pre-IBC release. 3D has clearly become one of the most important new technologies for the consumer electronics industry, with major manufacturers desperate to convince the public that it is not simply a gimmick. With the likes of Sky launching a 3D channel in the UK the need for professional level 3D rigs is paramount, and Canon is getting in on the act.